What is the role of a Pastry Chef? Pastry Chef's are responsible for supervising the daily operations of the bakery and pastry sections of a kitchen. 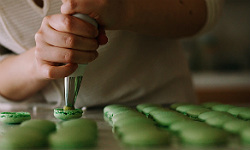 Their role requires understanding and utilisation of modern and traditional techniques to prepare sweet and savoury goods, including pastries, cakes, cookies, pies and breads. Pastry Chef's commonly have a keen eye for detail and are subsequently involved with decorative tasks especially those concerned with dessert. Pastry Chef's work closely with the Executive Chef and Sous Chef to develop current dishes and create new seasonal offerings and specials. Day-to-day responsibilities include: checking stocks, equipment and food quality.